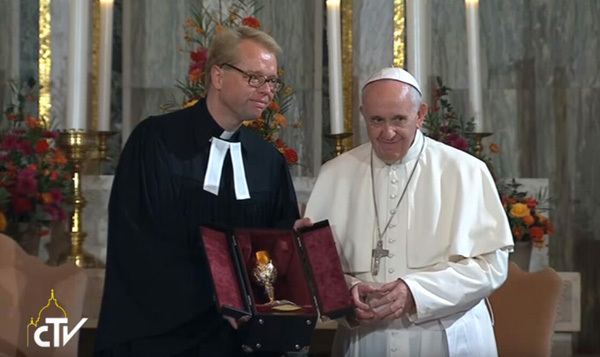 On the occasion of his visit to the Lutheran temple in Rome on November 15, 2015, Pope Bergoglio offered the minister a chalice, above. It was a clear reference to the Eucharist. However, the Lutherans do not believe in Transubstantiation and, therefore, do not believe that Our Lord Jesus Christ is really present in the Eucharist. So, the symbol of the gift is ambiguous. It can mean: “Your idea of the Eucharist is correct and I agree with it.” Or, it can also be an invitation for them to believe the Catholic dogma on this topic. Taking into consideration the context of ecumenism that permeated the visit, the interpretation of the symbol should be understood as the first, unfortunately. Bergoglio took advantage of the opportunity to show off his thespian skills by making a remarkable display of clownish expressions. Full footage of the visit here.